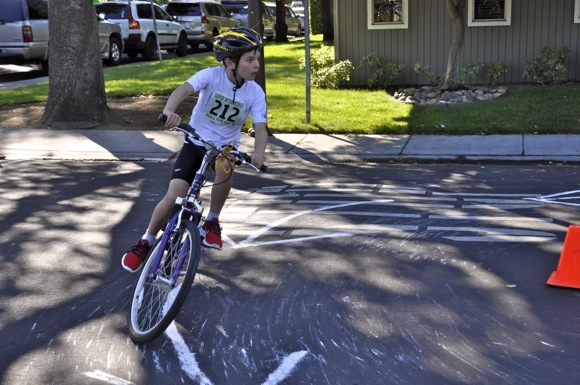 The first of what organizers hope will become an annual summer event — a children’s triathlon for ages 6 through 14 — was held this morning at Burgess Park in Menlo Park. About 300 young athletes took part. The park and pool did lend itself to a compact event that could be enjoyed by the parent spectators. All the kids started in the pool, oldest to youngest. Those six and under swam 25 yards, 7-10-year-olds 100 yards, and 11-14-year-olds 200 yards. They’d stationed their bikes near the picnic grounds, and after completing their swim, headed off on a one-mile bike loop that utilized Burgess Dr. and Alma St, which had been closed to traffic. The distance was, again, determined by age group: 1 mile for six and under, two miles for 7-8 years olds, four miles for 9-10 year olds, and six miles for those 11-14. 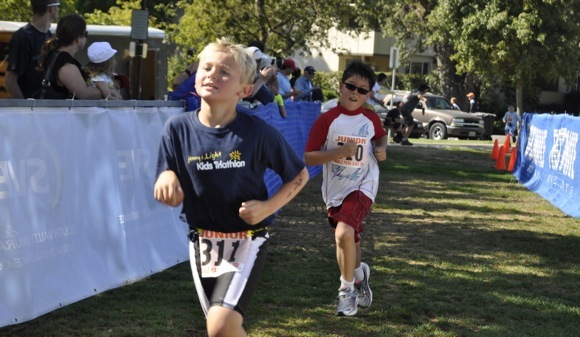 The young triathletes finished with a run: 1/2 mile for 6-10 year olds and 1.5 miles for 11-14 year olds.